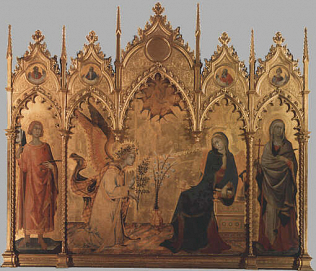 This Annunciation was painted by two painters from Siena Simone Martini and his brother in law Lippo Memmi. At the bottom of the painting we can find something which was not so frequent at that epoch, especially if we compare this work of art to the more modern ones: not only does the painting indicates the exact year when it was painted 1333, in addition to that, we can also read the two names of the painters. If we compare this Annunciation to the Florentine paintings displayed in the previous room, we can easily perceive the elegant attitude of the Virgin Mary, which is typical of the Sienese sensitivity. The sinuous line by which Simone Martini and Lippo Memmi rendered the figure of the Madonna perfectly reveals the delicacy, elegance and nobility of the Virgin Mary.